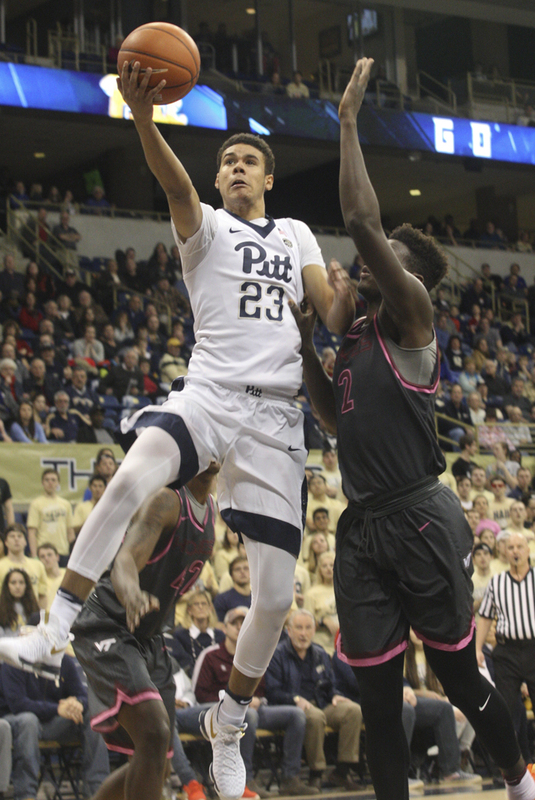 The Pitt men’s basketball team entered its showdown with the Virginia Tech Hokies with a chance to extend its two-game winning streak and make a late-season tournament run. That momentum evaporated Tuesday night as the Hokies rallied to steal a 66-63 victory in front of a stunned Petersen Events Center crowd. Pitt (14-12 overall, 3-10 ACC) had an opportunity to win the game late, as the team got three open 3-point shots with less than 30 seconds left. All three attempts hit the rim, and the Hokies (18-7 overall, 7-6 ACC) walked away with a dramatic, come-from-behind win. The Panthers took the lead early, starting the game with an 8-0 run capped by a 3-point basket from point guard Jamel Artis. The team continued to shoot well over the next couple of minutes, and Virginia Tech coach Buzz Williams called a timeout after Pitt took a 18-8 lead with 14:22 left in the half. Shooting and rebounding were key to Pitt’s early success. The team shot 60 percent from the field in the first 10 minutes of play, while the Hokies shot half that at 30.8 percent. The Panthers dominated the boards as well, grabbing an 11-5 advantage in rebounds. The Hokies then began to cut into the lead, and a 3-pointer by guard Justin Robinson made it 27-20 with 6:58 left in the half. A minute later, the Hokies’ deficit was down to four after another 3-pointer. The Panthers responded, and two 3-point baskets by Artis and Johnson put Pitt back up by 10. Play was even for the rest of the half, and the Panthers took a 40-29 lead into the break. Johnson led the Panthers in the first half with 14 points and seven rebounds. The sophomore went 5-7 in the first half, including 4-5 from 3-point range. Guard Ahmed Hill led Virginia Tech in scoring, tallying 10 points on 3-6 shooting. Crisp ball movement and strong play in the post helped free up room for Pitt outside shooters in the first half. Virginia Tech started strong in the second half, cutting the Panthers’ lead to six in the opening four minutes. But a 3-pointer from Artis stretched it back to nine with 15:22 to go. The teams went back and forth over the next couple of minutes with the Hokies outscoring the Panthers 5-4. At the second media timeout of the half, Pitt led 52-44. Then, things started to fall apart for the Panthers. The Hokies surged, going on an 12-0 run to take a 53-52 lead, their first of the game. Off a fastbreak started by a Chris Jones turnover, Hill broke through the Panthers defense, forcing senior forward Michael Young to intentionally foul him from behind. Hill made the shot and his two free throws, then the Hokies received possession of the ball on Pitt’s baseline because of the intentional foul. Guard Justin Bibbs promptly hit a 3-pointer off the inbound, giving Tech its first lead of the game. Pitt came right back, scoring five straight points to retake the lead, 57-53. But the Hokies responded with six consecutive points of their own to go back up by two with 4:25 to play. The Panthers again retook the lead on a layup by Young with 3:19 to go. A minute later, Pitt forward Sheldon Jeter got fouled, sending him to the free-throw line for a one-and-one opportunity. Jeter couldn’t convert, but the Panthers grabbed the rebound and drew another foul as the shot clock wound down. This time, Jeter hit both shots, giving Pitt a 63-59 lead with 1:53 to go. The Hokies made a pair of free throws on their next possession, and following a Panther turnover, Tech took a 64-63 lead on a 3-pointer from guard Seth Allen with 1:08 left in the game. Young missed a 3-point attempt on Pitt’s next possession, and Robinson made two free throws for the Hokies to put Tech up three with 29 seconds left. With the ball on the last possession, the Panthers looked for a three to send the game into overtime. Johnson found himself open in the corner, but his shot missed the mark. Young was able to corral the rebound and pass it out to Artis for another three-point shot, but again, the ball clanged away. Jeter got the rebound and dribbled out to the 3-point line for the Panthers’ third try, but his shot missed as time expired. In front of a deflated crowd, the Hokies’ bench ran onto the court to celebrate their improbable win. As the fans quietly filed out, the scoreboard read: Virginia Tech 66, Pittsburgh 63. After shooting 48.5 percent in the 20 minutes, Pitt shot only 33.3 percent in the second half. The drop-off in production has become a trend this season, and Stallings expressed his frustration in the team’s effort after the game. This loss hurts the Panthers, who led for over 34 minutes of the game. Going into the contest, the team had the opportunity to climb back into the NCAA Tournament conversation with a win. Those hopes take a big hit with the loss, but the Panthers will look to bounce back on Saturday, Feb. 18, when they host No. 17 Florida State at 4 p.m.